A form normally processes payments through the eWAY account configured in the add-on settings. If you need to process payments with different accounts, you can do that by altering the feed settings. 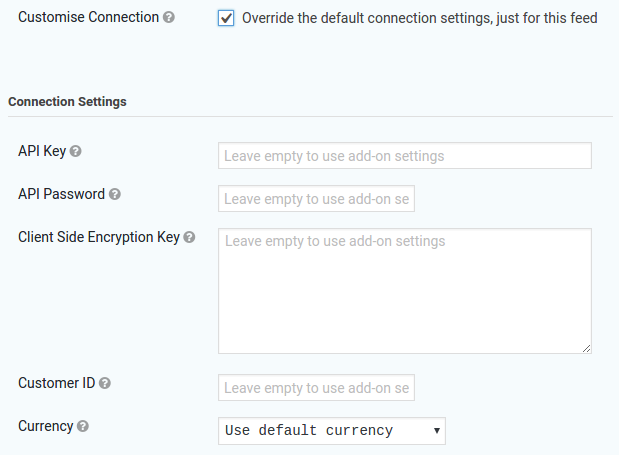 Tick the Customise Connection checkbox in a feed, and you get additional fields where the add-on settings can be overridden. These include the API key / password, Client Side Encryption key, and the currency used. NB: currencies with different currency symbols are tricky, because Gravity Forms manages the currency symbol based on its own settings. Mixing currencies with the same symbol on one form is OK. Currencies with different symbols should get their own form, to avoid confusing people.